(Trent Nelson | The Salt Lake Tribune) The Tabernacle Choir at Temple Square sings at the General Conference of The Church of Jesus Christ of Latter-day Saints in Salt Lake City, Saturday Oct. 6, 2018. And the first shall be ... first. “Let Us All Press On: Hymns of Praise and Inspiration” took the top spot on Billboard’s Classical Traditional chart, officials said in a news release issued Thursday. It’s the 13th time that an album from “America’s Choir” has earned the lofty honor. 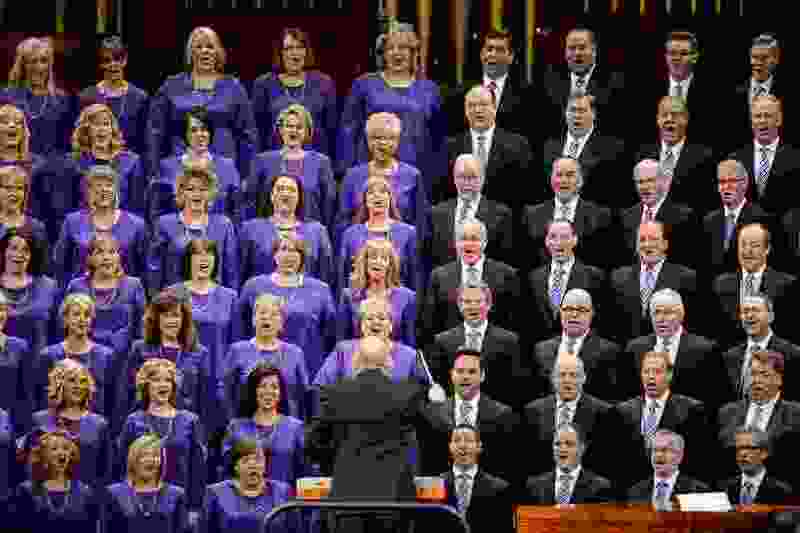 The name of the world renowned 360-member group — formerly called the Mormon Tabernacle Choir — was changed last October by leaders of The Church of Jesus Christ of Latter-day Saints. The change came after President Russell M. Nelson’s August 2018 edict to use the church’s full name and discontinue using the term “Mormon” as shorthand for the Utah-based faith and its members. “Let Us All Press On” marks the first full-length album of hymns from the choir in almost seven years. It features 14 new tracks, including beloved classics like “All Creatures of Our God and King” and “More Holiness Give Me.” It is available on iTunes, Amazon and DeseretBook.com. The album also contains the hymn “Our Prayer to Thee,” with text penned by Nelson in 2003, about 15 years before he became the Utah-based faith’s 17th president. It was matched to a tune by composer Joseph Parry.